A 57 year old woman underwent total thyroidectomy for bilateral nodules. The right lobe revealed a 2.1 cm papillary thyroid carcinoma, classical type. The left lobe showed a 1.7 cm medullary carcinoma. 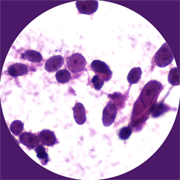 Immunostain for calcitonin, performed on the left nodule, was strongly positive. Neither tumor showed lymph vascular invasion or extrathyroidal extension. Four (of 9) lymph nodes were positive for papillary carcinoma; two (of 4) lymph nodes were positive for medullary carcinoma.